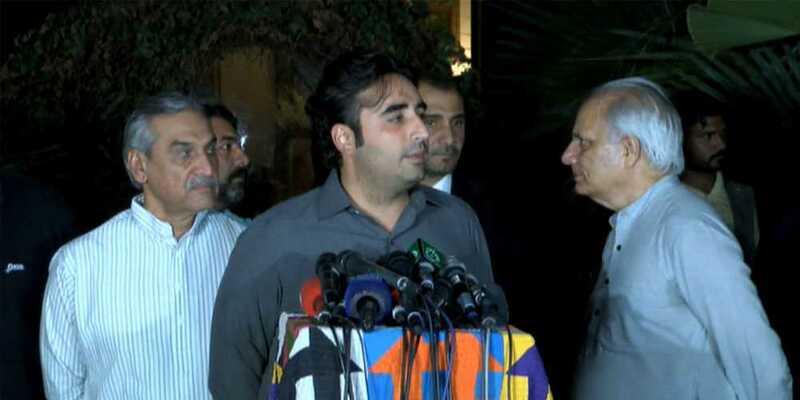 Chairman Pakistan Peoples Party (PPP) Bilawal Bhutto Zardari has said that the merger between Pakistan Tehreek-e-Insaf (PTI) and Southern Punjab is a drama, I knew about it a long time ago, they will never talk about the Southern Punjab Province after the elections. Speaking to the media, Chairman PPP said that only his party will be the one to make Southern Punjab province. We were the ones who urged the Senate to pass the resolution, these people opposed it, and when PPP comes in government after winning the elections, we will make Southern Punjab province. Bilawal Bhutto Zardari said that Nawaz Sharif doesn’t have the courage to be straightforward and clarify himself. He is putting the system in danger with his childish behavior, since the last 3 years he is talking about Panama and why I am ousted, as if there is no other issue left in the country. Chairman PPP reacted to a statement of Prime Minister Shahid Khaqan Abbasi saying that I would not be a part of something like that and also when we used to say that bring matters in the Parliament, they used to neglect it. Why would I support it now, in order to save a certain person? The Parliament has a right to summon anyone, but when the institution wanted to adapt positive reforms, but Nawaz Sharif opposed us, now no one will take him seriously. If you want to make accountability better, then PPP wants reforms, but we don’t do it at a time when cases are against us. Nawaz League members have always done the politics for their own benefit. They have always done the same every time, PPP thinks that the party that comes in power, has a lot to do, and they will be the ones to carry out reforms.